Not far from Bosherton lies this amazing and historic site. Dating back to the sixth century, the site marks where Saint Govan, a 6th century hermit, chose to live a religious life. Saint Govan lived in a cave located on the site of where the chapel is, perched high up in the cliff face and it presents a wonderful dramatic scene for any artist to admire it. With the chapel clinging to the ragged limestone rock and the headland fading in the distance, it certainly captured my imagination when I visited the place a few years ago. It is a truly remarkable location and on a warm, sunny day, the view of this magical place will remain with you for ever. 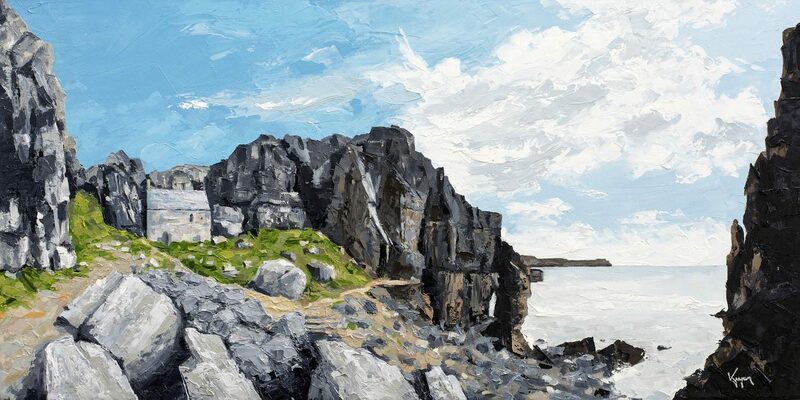 My painting reveals this unique and legendary site with the craggy structure of the rockface featured quite prominently above the Chapel and a hint of the beautiful Pembrokeshire coastline.